LG today announced its portable mobile phone printing device in India and it will be available at a price of Rs 14,990. The product is named as LG PD233 Pocket Photo Printer and it will be available across LG stores. The portable photo printer is very compact in size so that you can carry it with you and print photos from your mobile phone anywhere you are. Android and iOS devices are supported with the pocket printer. The compact size and portable nature of the device can be estimated by reading the dimension which is only 72.4mm wide, 120.9mm long and just 24mm thick. The pocket printer weighs only 212 grams and it’s available in one single body color which is Silver. LG has been known for manufacturing consumer electronics since many years and now it’s an established brand in the global market. To keep the same reputation get going LG has introduced better performance in this smallest pocket photo printer. It can print photo within 40 seconds which shows that the printer is really speedy. The maximum resolution of the photo that can be printed is 640×1224 pixels which is good enough to print quality pictures on the go. The photos can be printed via Bluetooth and the device can be charged within 1 hour and 30 minutes. The LG PD233 pocket photo printer holds on to a standard Li-Polymer battery and it even supports NFC tag. The feature of social integration is also there as the pocket printer of LG supports Facebook and Twitter. As soon as you capture the picture of any live moment then you can start the pocket printer and connect your mobile phone via Bluetooth. Now you can directly give print command and the photo will be printed within 40 seconds. You can also insert tag within the photo so that you can memorize the moment in the picture. The LG Pocket printer don’t need any cartridges as it works only with special Zink photo paper 2.0 which don’t require any ink. To further increase the functionality, you can download the Pocket Photo app from the iTunes store (iOS devices) or GooglePlay store (Android devices). This app will not only make printing process easy but also provides photo editing tools that can be used to further add extra toggles to the pictures before printing. The Android version supported is 2.2 and all above while iOS version supported is 5.1 and above. This means, the pocket printer of LG is compatible with almost every Android and iOS devices. 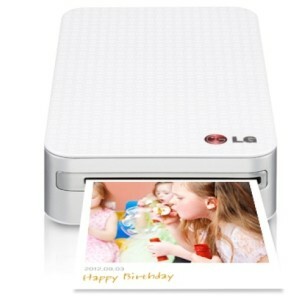 The LG PD233 Pocket Photo printer can also add QR code to any picture which can be shared to the social networks then. This will make photo sharing and printing further simpler. Till now the pocket printer concept and features are looking good but let see what reviews says about this device. The price tag is Rs 14,990 and you can get it either online or from your nearest LG store.